We are so happy for these wonderful female entrepreneurs and our client, Upohar! We wish you all the success in the world! Last weekend, three women moved blenders and bananas, cooking equipment, chopping blocks and big containers of vegetable oil into a commercial kitchen in a little mint-green building on West James Street in Lancaster city. On Tuesday, they took their new food truck out for a spin near Franklin & Marshall College. In just two hours, they had sold out of all the international dishes they had prepared. From left, Christina Maldonado-Coffey, N. Dianne Gadbois and Srirupa Dasgupta have a new catering kitchen on West James Street that will support their new partnership: Upohar — Global Flavors Catering. It was the end of three separate culinary journeys, and the beginning of a new, shared path. 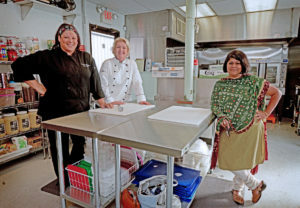 Christina Maldonado-Coffey, owner of Catering by Christina; N. Dianne Gadbois, owner of The Global Kitchen catering; and Srirupa Dasgupta, catering under the name of her former restaurant, Upohar, have joined forces. Their new food business will produce global fare while helping refugee women change their lives. The different business lines are the new Global Flavors Catering; the Catering by Christina stand (soon to be renamed Christina’s Criollo) at Lancaster Central Market; and Upohar Catering. Dasgupta is in negotiations for a downtown Lancaster location at which to reopen her Upohar restaurant, which closed in Manheim Township in the spring. A lot of change has occurred in the lives of these three women recently. And the inspiration they draw from one other provides the energy driving the new venture. Several years ago, Maldonado-Coffey was worried about losing her factory job during a layoff scare. So she took a tour of the Pennsylvania School of Culinary Arts at the YTI Career Institute in Lancaster. Maldonado-Coffey eventually graduated from the culinary school, having had Gadbois as a marketing teacher. Maldonado-Coffey opened Catering by Christina and a stand of the same name at the city market. Though its name will change to Christina’s Criollo, the stand still will feature the Puerto Rican-style food for which Maldonado-Coffey is known. Meanwhile, Gadbois, who had experience as a chef and restaurant manager for prestigious hotel restaurants in Boston, quit her job at the culinary school and started her own catering company. When Gadbois started The Global Kitchen earlier this year, she signed up to cook at East Side Community Kitchen — a shared kitchen space for local food businesses. There, she discovered her former student, Maldonado-Coffey, cooking for her own catering company. That’s when Maldonado-Coffey told Gadbois how she’d been inspired by the sight of her during that culinary school tour years earlier. The student who inspired the teacher now advised her on how to run her new business. Maldonado-Coffey and Gadbois eventually catered a private dinner together. “It was like we’d been working together for 20 years,” Gadbois recalls. In June, the two women catered a luncheon for Martha Stewart, who was at Shadowlight Group, a Leola-based photo and video soundstage, to film promotional spots for her cabinetry line. Once again, the two women loved working side by side. Dasgupta was working in the Franklin & Marshall College communications office when in 2011 she started Upohar — which means “gift” in Bengali — as a catering company that would employ refugees. The cuisine reflected the countries from which the refugees came: Iraq, Nepal, Congo and beyond. Upohar became a bricks-and-mortar restaurant on West Roseville Road in 2014, but closed for lack of steady customers in March of this year. For about three years, Dasgupta had been trying to get Maldonado-Coffey to be her manager or work with her in some other capacity. “The point of Upohar is not just to be another restaurant or catering company, but it is to be a vehicle to provide jobs and economic development to this group of disadvantaged people (refugee women),” Dasgupta says. Dasgupta told Maldonado-Coffey she needed two qualified managers to train these refugee apprentices. Maldonado-Coffey was ready to take her business in a different direction, so she finally said yes in August, agreeing to become Dasgupta’s partner. Gadbois was across the table at East Side, listening to the two women talking about their new project, and she started thinking about what was missing in her new business. She became the third Upohar partner in September. The three moved their operations from East Side to the new Upohar catering kitchen last Saturday. Now, Maldonado-Coffey and Gadbois will run the catering kitchen —producing international cuisine including Puerto Rican and both vegetarian and nonvegetarian global fare. They’ll take turns doing catering gigs and going out with the food truck. “Once we have our foundation stable, we’ll start employing (refugees) again, through Church World Service,” Dasgupta says. Maldonado-Coffey and Gadbois will train the refugees as apprentices, until they’re ready to be placed in permanent jobs outside Upohar.